CRISPR/Cas9: Could the Gene Editing Technology be the Future of Drug Discovery? The emergence of CRISPR/Cas9 technologies has enabled almost unlimited gene editing opportunities. Not only could it be used as a therapeutic tool, the genome editing tool could kickstart a revolution in drug discovery. To date, much of the attention on CRISPR/Cas9, which stands for clustered regularly interspaced short palindromic repeats, has revolved around its potential as a therapeutic tool and the possibility of engineering the human genome, crops or livestock. In fact, it will be tested in the clinic for the first time in Europe this year by CRISPR Therapeutics for the treatment of the blood disorder, β-thalassemia. However, the real revolution appears to be taking place in the lab. In 2015 alone, there were 1,185 publications – equal to 3 a day – relating to the new gene editing system, and scientists have hacked the system to do far more than just cut DNA. CRISPR/Cas9 appears to be emerging as a key tool for drug discovery ranging from target identification and validation to preclinical testing. Jon Moore, CSO of Horizon Discovery, once said: “The targets we’re finding with CRISPR/Cas9 are going to guide the drugs coming out in the 2020s.” Not long after the first publication on the genome editing tool in 2012, Horizon started to recognize the vast potential of the technology. “Around 2013 we started getting interested in CRISPR/Cas9… and over the next year and a half we went from predominantly generating models using AAV to almost exclusively using CRISPR/Cas9,” Chris Lowe, Head of Research Operations at Horizon, told us. Today, the company uses CRISPR/Cas9 across all of its platforms from engineering customized cell lines or animal models to performing functional screens. “We can generate hundreds of knock-out models a month on a rolling platform. And that’s really only possible because of the CRISPR/Cas9 technology. It’s pretty much all pervasive,” Lowe continued. RNA-guided Cas9 nucleases, taken from the bacterial immune systems, allow the fast and accurate alterations of genomic information in animal models and human cells. Although genome editing tools are not new, Lowe explained: “the benefit of CRISPR really is in the speed and ease with which you can create the reagents necessary to perform gene editing.” This means that the limitations of its genome engineering predecessors like zinc-finger nucleases and transcription activator-like effector nucleases (TALENs) can be overcome. The Cas9 enzyme is directed to specific locations in the genome by a short piece of ‘guide RNA’ and cut the DNA. The guide RNA sequence can be changed to target Cas9 to any site within the genome. The synthesis of short pieces of RNA is far simpler than engineering an entire protein and then directing it towards a specific DNA sequence. Cas9 makes a double-strand break in the DNA, which is repaired by the cell’s error-prone DNA repair machinery. That alone is usually knocks-out the gene of interest and allows scientists to study what happens to cells or organisms when a targeted gene or protein is shut off. Alternatively, the scientist can provide a piece of new DNA, maybe a new gene, which is then built in at the target site. 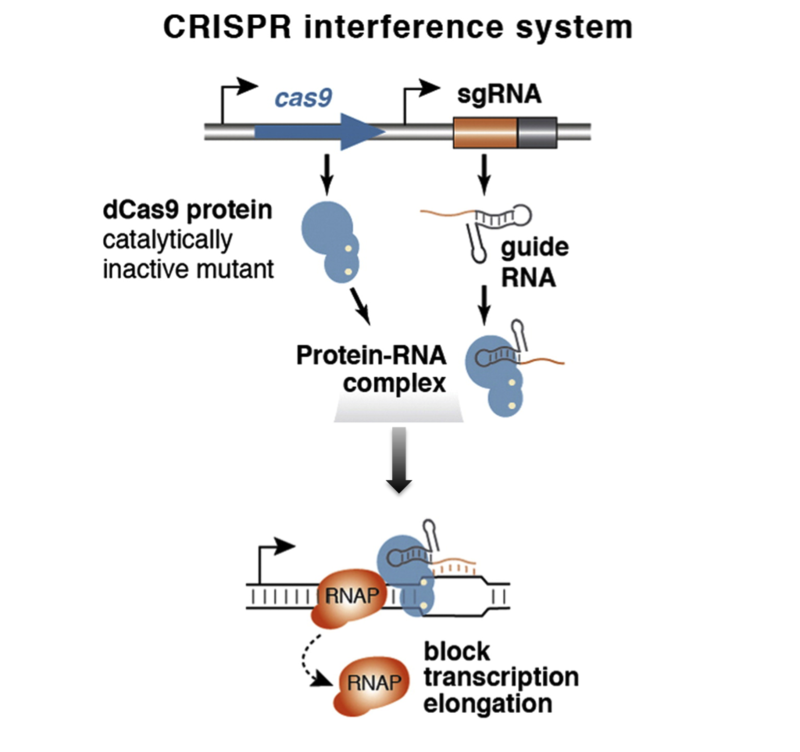 The mechanism by which CRISPR/Cas9 edits the genome. CRISPR gives scientists the opportunity to engineer and study almost all cell types in the body and it has become common practice around the world. With the system being so fast and cost-effective, scientists are now able to conduct high-throughput knock-out screens to speed up target discovery. Using retroviral libraries of guide RNAs that target every gene in the genome, CRISPR can be used to generate thousands of different cell lines at once, each containing a different guide RNA that targets a particular gene. Feng Zhang’s lab, the first to use CRISPR to engineer human cells, made use of such genome-wide screens to address treatment resistance to melanoma. BRAF V600E is a common cancer mutation that is treated by the FDA–approved drug vemurafenib. Yet, the rapidly mutating cancer cells quickly become resistant, and by week 24 of treatment, the tumors return. “We thought this might be an opportunity for us to apply a genome-scale library to see what are the genes—when you either turn them on or turn them off—that would render the tumor cell resistant to vemurafenib,” Zhang explained. Principle setup of a CRISPR screen. In addition to identifying genes that make cells resistant to specific drugs, researchers are using the system to screen for genes that are essential to cancer survival, with researchers at the Wellcome Trust Sanger Insitute finding that the inhibition of the METTL3 gene kills leukemia cells. Meanwhile, others are using CRISPR screens to search for the ‘survival factors’ of pathogens like Zika and Dengue. Generating a new disease model used to be a laborious and expensive process limited to a few species that came with a good toolkit for genetic manipulation. “CRISPR now allows us to generate much better animal models that really reflect the human situation,” commented Bladt. Today, CRISPR/Cas9 has been used to engineer a wide range of species including rats, dogs, and cynomolgus monkeys, which are all commonly used during preclinical drug discovery. Others are using it to engineer the genome of ferrets to alter their susceptibility to flu infections. Ferrets are much better influenza transmission models than mice as they sneeze when infected. Creating a mouse model with multiple mutations took years due to lengthy backcrossing, costing around $20,000 to create a single mutation. CRISPR/Cas9 has reduced the length of this process down to a matter of months or even weeks. Lab mice are a common model used for the development of new drugs. When Jonathan Weissman’s group at the University of California, San Francisco (UCSF) got hold of CRISPR/Cas9, the first thing they did was ‘break the scissors’. The group mutated the Cas9 protein so that the enzyme bound to the DNA but could no longer cut it. This meant that genes could be turned off without changing the DNA sequence. They then attached Cas9 to a protein that activates gene expression, giving them a simple system to turn genes on or off. Despite once again being snubbed by the Nobel Prize Committee, there is no doubting its potential, with a number of new tools being developed to impact the drug discovery process. The system has redefined what we believed to be possible in R&D, forcing many biotech and pharma companies to turn to the technology. Novartis recently entered a partnership with Jennifer Doudna’s Caribou Biosciences to access the company’s CRISPR/Cas9 drug screening and validation technologies, while AstraZeneca signed four research collaborations to use the technology across its entire drug discovery platform. Similarly, Evotec teamed up with Merck to access its CRISPR libraries that are based on a license from the Broad Institute. And things may be about to get even better with the discovery of a more precise genome editing technique: base editing.